The large display in the atrium-style lobby creates an immediate branding impression on visitors. The company markets and distributes spices, seasoning mixes, condiments and other flavorful products to the entire food industry – retail outlets, food manufacturers and foodservice businesses. The goal with this NanoLumens installation was to add an impactful branding message in the lobby of the new headquarters. 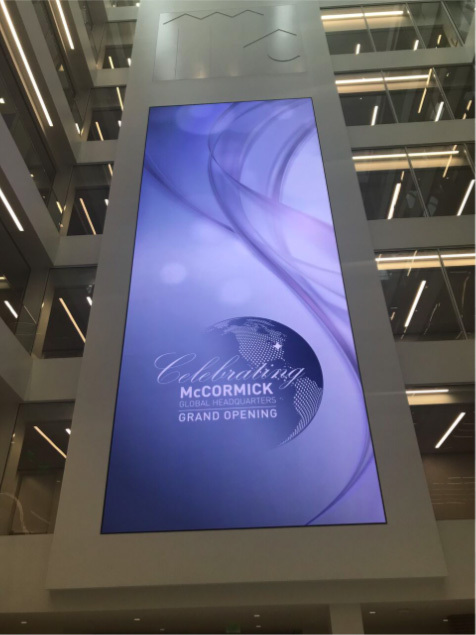 The challenge for the integrator Whitlock was installing a display that would span four of the building’s six floors and be visible as soon as visitors walked into the headquarters. The site’s open floor plan features an atrium-style lobby design with an abundance of natural light shining through, with each floor visible as soon as you enter the building. The NanoLumens display is 45-by-18 feet and stretches from the second floor all the way up to the fifth floor. Michaelis added that McCormick & Company also wanted this installation to show that this 129-year-old company continues to embrace state-of-the-art technology and innovation. That message, along with conveying the company’s leadership position in the spices, seasoning mixes, and condiments markets, also includes a continuing focus on advancing safeguards centered on the long-term vitality of the planet. The entire building is designed to be Leadership in Energy and Environmental Design (LEED) Gold certified and reflects McCormick’s commitment to sustainability and incorporates locally-sourced, reclaimed wood and an indoor green roof with native Maryland plantings. All the furniture in the building is non-toxic, chemical-free, and largely comprised of recycled material, according to the company. McCormick & Company also seeks to promote composting throughout the building by only providing compostable serve ware to employees and implementing an advanced waste management system. 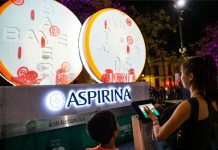 And NanoLumens has also responded to this demand for more sustainable goods as their LED displays offer environmental benefits such as reduced power consumption, up to 50 percent reuse of reclaimed materials from previously manufactured goods and easy recycling due to a nearly completely recyclable product. All this is now part of the all-important first impression the NanoLumens display conveys as visitors enter the new McCormick & Company headquarters. The “joy of flavor” has never tasted so good. To watch the NanoLumens display in action, click here. Whitlock is a video collaboration company that advises on the best technologies to create the most impactful environments to drive positive change. The company consists of strategists, integrators, engineers, workplace experts, and support teams motivated to help clients get more face-time with the people that matter to them the most. Whitlock exists to help build your next big ideas together and then share it with the world. For more information, visit https://www.whitlock.com. Headquartered in Atlanta, Georgia, NanoLumens partners with clients to create uniquely compelling, interactive LED visualization solutions that take the guesswork out of owning a display network. 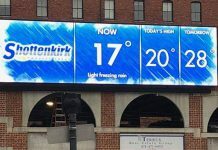 As the fastest growing visualization company in the U.S., their experiential LED displays exceed the imaginations of global clients in retail, transportation, corporate, gaming, higher education, sports and arenas, and houses of worship. Through world-class proprietary technology, NanoLumens displays are ultra-thin and lightweight, energy efficient and available in any size, shape or curvature. NanoLumens solutions are proudly designed and assembled in the United States of America and come backed by an industry-leading six-year warranty. For more information, visit www.nanolumens.com.